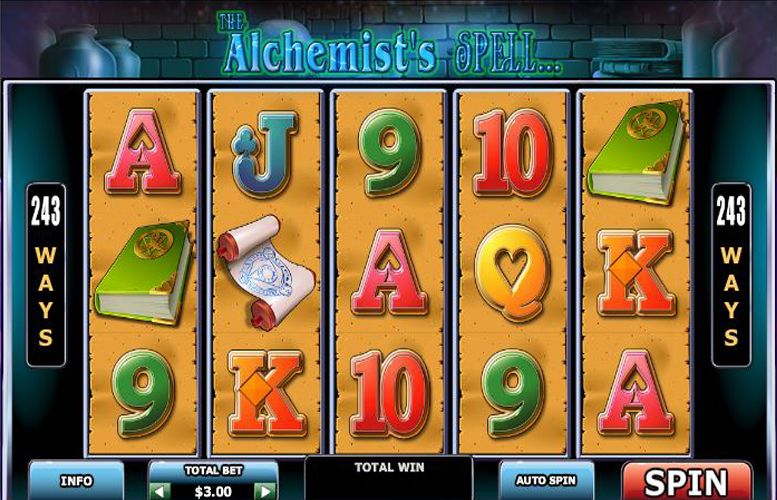 The Alchemist’s Spell slot machine from Playtech is differs from its peers in many key respects. 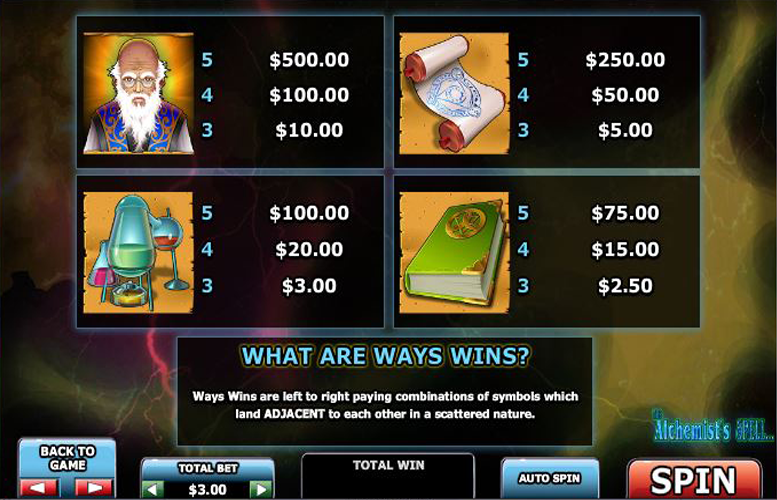 It uses “ways to win” rather than strict win lines and has a unique take on free spins. Unfortunately, it relies too heavily on these features and neglects to include any other bonuses. That said, the large multipliers that can be triggered during free spins does somewhat compensate for the lack of gameplay variety. In terms of design, the machine has five reels, and three rows. The game’s art style isn’t necessarily bad but with such a subject matter, it could certainly be improved. It just doesn’t conjure up the feelings of mystery you’d expect from a game about alchemy and magic. Innovative approach to free spin round. The inclusion of a potential 30x multiplier makes The Alchemist’s Spell’s only game feature one that could bag some serious returns to players. Pay table is incredibly difficult to work out. It’s use of decimal multipliers make it a pain to understand the amounts awarded for various combinations. Just one feature. It is a pretty good one that has the potential to pay players well but the lack of variety makes for a slot with limited replay value. The free spin multiplier bonus isn’t as straightforward as it might be, and could be perceived as further complicating an already confusing game. 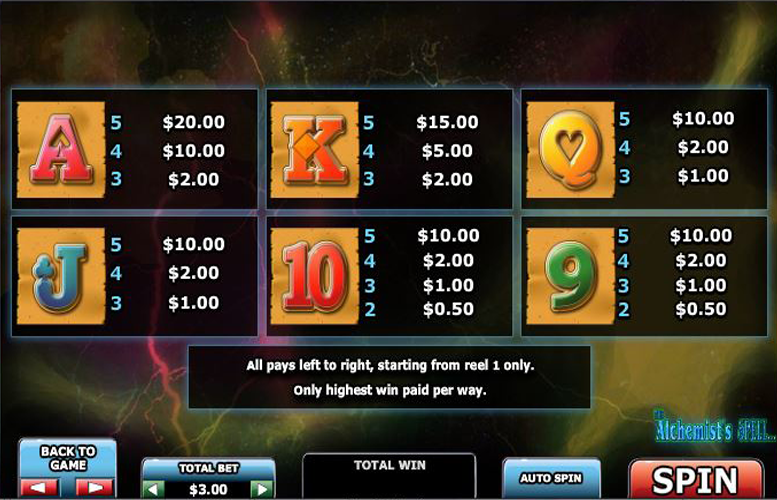 Unlike many other virtual slot machines, winning combinations do not have to adhere to strict win lines. All symbols behave as “scatters” giving 243 ways to win on every spin. This number is fixed, however. The Alchemist’s Spell might not be a particularly feature-rich but its free spin mode is quite a creative take on the classic slot machine bonus stage. There’s also the opportunity to win big with some enormous multipliers too. 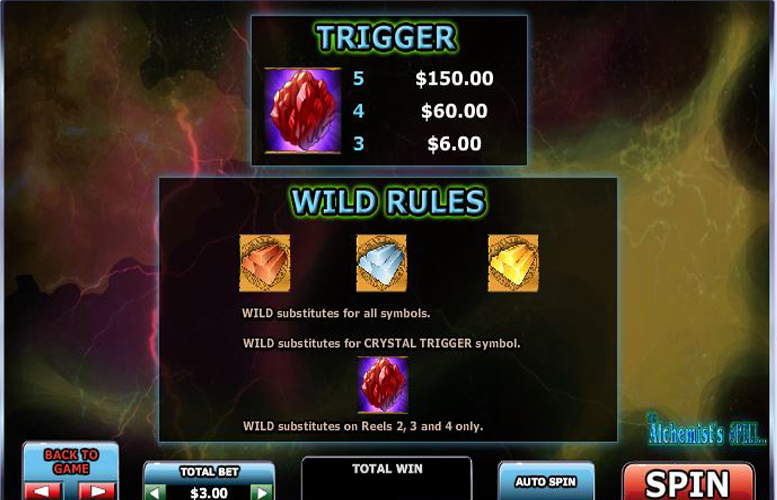 Landing three, four, or five crystal “trigger” symbols left to right wins 10, 15, or 20 free spins respectively. During these free games, wins where the Bronze “wild” symbol substitutes for another on reel two are multiplied by 2x. Likewise, those wins where the silver “wild” symbol substitutes on reel 3 are multiplied by 3x. Finally, wins where the gold “wild” symbol substitutes on reel four are multiplied by 5x. 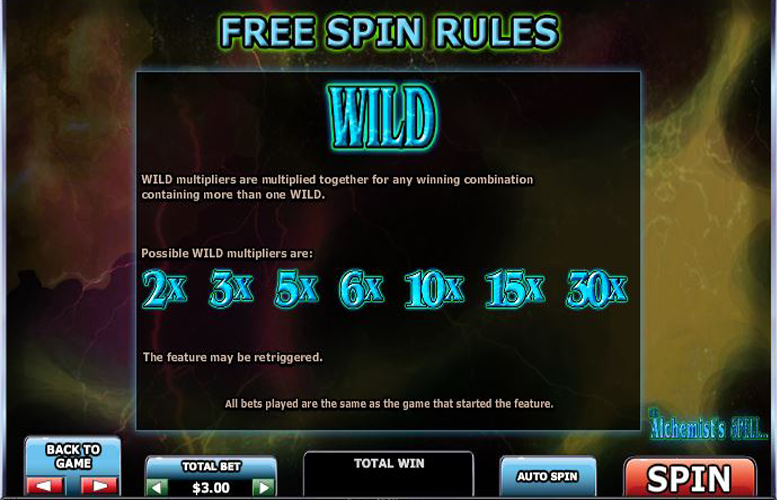 In addition, these “wild” multipliers are multiplied together for any winning combination containing more than one wild. The possible “wild” multipliers are 2x, 3x, 5x, 6x, 10x, 15x, and 30x. What’s more, this feature can be retriggered indefinitely. All told, The Alchemist’s spell isn’t a bad machine. It’s not the most exciting offering visually, and it can be tricky to fully understand how payments work but there isn’t much to hate about it. 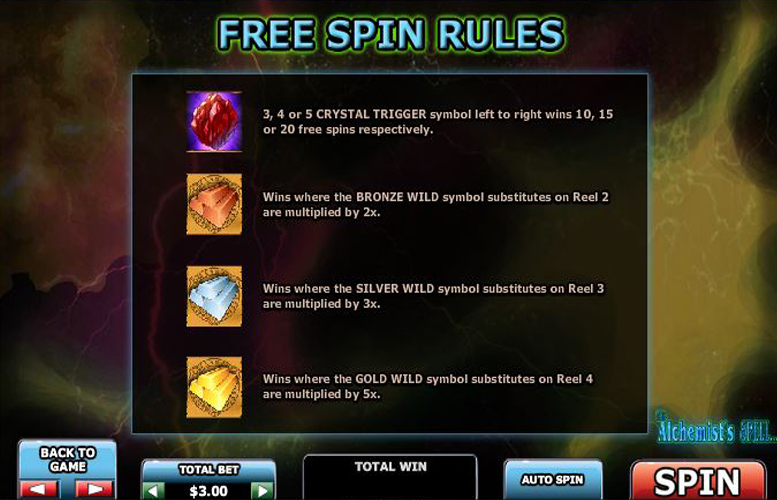 The free spin mode is great and potentially very lucrative, even if the specific rules are a little complicated. For players who have grown bored with standard pay line machines, offering a free spin mode with a small multiplier, The Alchemist’s Spell might be ideal. However, most will likely prefer a machine with a less awkward pay table, and more bonus features. This game has a rating of 4 / 5 with 347 total reviews by the users.